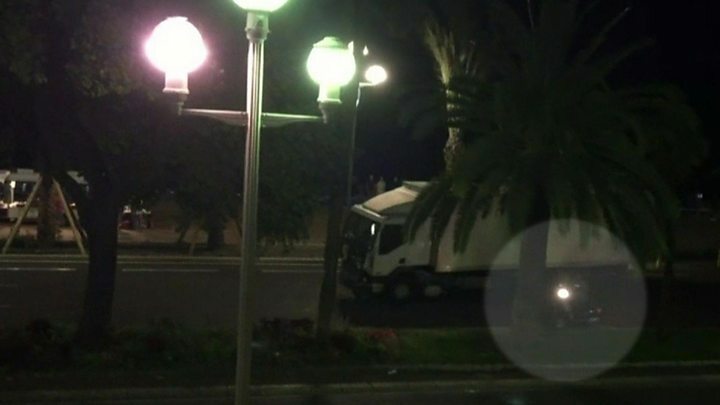 A Frenchman who was caught on video trying to stop the lorry attack in Nice a week ago has given an interview, dispelling assumptions that he must have been among the dozens who died. The man who gave his name as Franck, told the newspaper Nice-Matin how he climbed onto the step below the cab and punched the driver through a window. The driver picked up a pistol and tried to shoot Franck, but could not fire it. Eventually, Franck was hit over the head with the pistol and he fell off. Nice-Matin said Franck had huge bruises on his back, a broken rib and a left hand swollen from the punches he threw. At least 84 people, many of them children, were killed when the lorry ploughed into a large crowd watching a night-time fireworks display on the seafront Promenade des Anglais on Bastille Day. The driver, a Tunisian resident in Nice called Mohamed Lahouaiej-Bouhlel, also fired at people with his pistol before being shot dead by three policemen. Grainy mobile phone video shows a man on a scooter driving alongside the moving lorry. He dumps the scooter, continues on foot and makes it onto the running board next to the driver's window. The man then falls off and appears to end up under the wheels of the lorry. It was widely thought that he was among the dead until Nice-Matin published the interview with Franck, a local airport worker in his late 40s, on Thursday. "In my mind I had images of bodies flying everywhere. I immediately understood what was happening," he told the newspaper. Clinging on to the lorry's left door, Franck punched Lahouaiej-Bouhlel with his left hand through the open window. "I hit and hit and hit him again with all my strength," he said. "I hit him in the face but he said nothing, he did not flinch. He had his gun in his hand and pointed it in my face. He pulled the trigger but it did not work." In the end, Lahouaiej-Bouhlel hit him on the head with the pistol and he fell off. Franck said that at the time he was "clear-headed and ready to die". A cyclist also tried to climb into the cab shortly before Franck. Alexandre Migues told Nice-Matin on Sunday that he clung onto the door handle and tried to open it several times, but was forced to let go when Lahouaiej-Bouhlel picked up the pistol and pointed it at him. Although he was disappointed that they did not stop Lahouaiej-Bouhlel, Mr Migues said videos of the incident showed he and Franck succeeded in slowing down the lorry and giving people more time to flee.